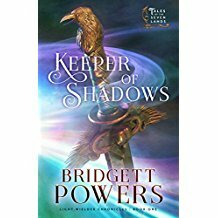 Keeper of Shadows is an overt Christian allegory. 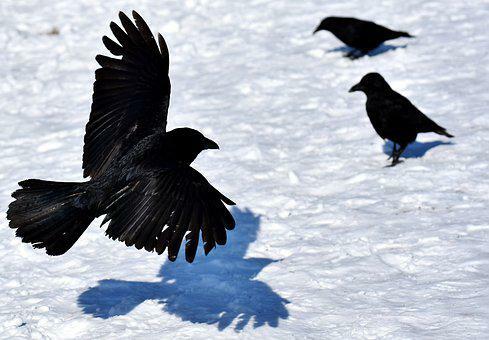 Noire, a human man cursed to live as a raven by day, has made an unholy alliance with the sorceress Venefica, in an attempt to break the curse. She sends him to spy on and ruin the beautiful and faithful Lysanne, who is all that stands between Venefica and the power she desires. Noire doesn’t believe in the King of All Lands, but the King isn’t finished with him yet, and a fierce battle ensues for his soul. noire doesn’t believe in the king of all lands, but the king isn’t finished with him yet, and a fierce battle ensues for his soul. Lysanne has no power of her own, but her strong faith in the King keeps Venefica’s Shadow Mist (which she gets from the Thief of Souls) at bay. She doesn’t blame the King for the low vision she has had since birth, and trusts him even when she is afflicted with chronic illness, but she struggles with self-doubt and self-worth. she doesn’t blame the king for the low vision she has had since birth…but she struggles with self-doubt and self-worth. This book overflows with spiritual themes. Redemption, self worth, and trusting God when bad things happen are major themes, as are trusting in God rather than yourself, true faith vs religiosity, and the idea that no one is so evil that they are beyond repentance. Believers in the King are not portrayed as perfect- they struggle with faith and sometimes sin against each other. There are magical creatures like unicorns, fairies and other amazing creatures, but they are all portrayed as agents of the King or the Thief of Souls. More than anything else, this book examines whether people who have chronic illnesses or have done terrible things can still be heroes of the faith. more than anything else, this book examines whether people who have chronic illnesses or have done terrible things can still be heroes of the faith. This Beauty and the Beast style fairy tale is set in a medieval world, so there are plenty of medieval words like cloister and fealty. I know what these words mean, but they made it difficult for me to immerse myself in the story at first, and I was not fully “hooked” until around the midpoint. Noire’s backstory is enthralling, and I wish there had been more time spent on that and less on romance. There were a few other objections I had concerning tropes, but telling you about them would require spoilers. My recommendation: I think this book would appeal most to women 16 and over who enjoy King Arthur type medieval romances and Beauty and the Beast style fairy tales. Chronic illness is a burden borne by many Christians, and this gift would be a great encouragement to them in particular. I’m looking forward to the next book in the series! Heat: There is a romance subplot. The two characters embrace gently a few times, sometimes by accident. A couple of times the man catches the woman as she falls. They kiss two or three times. One of those times is quite enthusiastic, but only the emotions are described. Violence: There is some sword fighting, and a few people are injured and die, but an obvious effort has been made to reduce violence. Much of the violence happens off screen. The most potent weapon in the book is prayer. Age recommendation: 16 and up, due to the heat rating and significance of the romance subplot. Disclaimer: I received a free copy of this book with a request for an unbiased review.